Mastitis is production-limiting, complex condition that can increase cull rates, veterinary visits and operating costs. Management and environmental factors are important and one way to help reduce mastitis, lower somatic cell counts and get more lactations per cow, is by taking advantage of hybrid vigor with crossbreeding. An indicator used as a standard measurement to assess the level of mastitis is the somatic cell count. This reflects the state of the herd’s udder health overall with an inflammatory cell count per mL of milk. This is called Somatic cell count and it has an impact on milk quality, reflects sanitation practices on the farm as well as udder health. The lower the count, the better the milk quality. With a high somatic milk count, there are deductions from the milk price also. 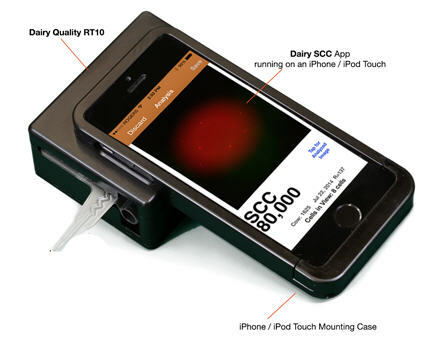 Somatic cell counts can be quickly determined with a simple, user-friendly hand-held device attached to an iPhone (check out http://www.dairyquality.com/). This allows early detection of Mastitis symptoms in dairy cows, permitting symptoms of mastitis to be treated early. Bad teats for example: Hyperkeratosis is a condition where the teat opening has formed extra tissue from milking and handling stress. This creates an easier portal of entry for pathogens. Poor milking machine maintenance causing teat damage or introducing infection may also be causes of mastitis in cattle. 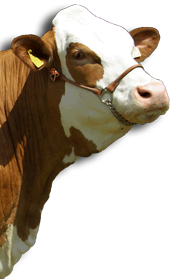 Many dairy breeds focus on the udder and its conformation. Fleckvieh has proven that also other traits when given attention produce an overall more powerful animal. Therefore they have a better immune system for example which can ward off infection like mastitis better. 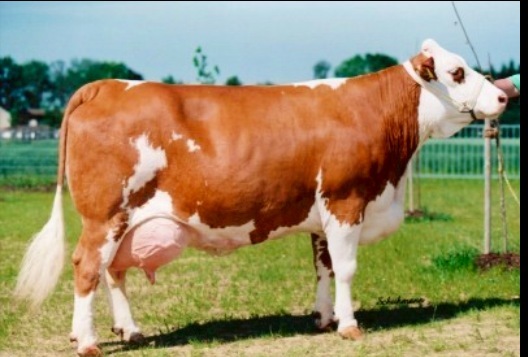 The act of crossbreeding in itself takes advantage of hybrid vigor and specific genetic expression: The F1 generation of Fleckvieh bred with another breed shows lower somatic cell counts because the Fleckvieh influence by their character makes for a flat lactation curve. This will stress the udder less and helps reduce mastitis. Lower somatic cell counts, less treatment costs, less penalties on milk prices and also a lower insemination rate right off the hop makes this a choice for many farmers to try Fleckvieh.